Todd and I had Tres Leches cake multiple times while we were on our honeymoon in the Dominican Republic. Before that I hadn't had any since my brothers 8th birthday party when he insisted that his birthday cake be a "milk cake" - which my mother found at the local pasteleria. All I can remember is her saying how heavy the cake was. The cake is actually a really light, airy sponge cake but is soaked in 3 different milks to make a very moist and delicious cake. In the Dominican, the cake was always served with chocolate sauce or sliced strawberries but since I didnt have either on hand, I used cinnamon to garnish the top. Preheat oven to 350 degrees. Grease a 9x13 baking pan. Mix flour, baking powder and salt in a bowl. In a separate bowl beat egg yolks and 3/4 cup sugar until creamy. Add milk and vanilla and beat until combined. Gently mix in flour mixture until combined. In a separate bowl, beat egg whites on high speed until soft peaks form. Slowly add in remaining 1/4 cup sugar until egg whites are stiff and glossy. Fold 1/3 of egg white mixture into other mixture to add air. Gently fold remaining egg whites into batter. Pour batter into pan and smooth out batter. Bake approximately 35 minutes until a toothpick inserted in center comes out clean. Let cake cool and turn out onto a rimmed platter. 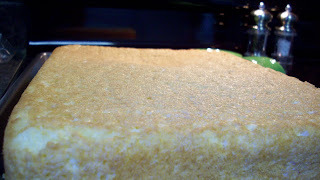 Allow cake to cool completely, you can refrigerate overnight if desired. Poke cake with a fork many times. Mix together evaporated milk, condensed milk, 1/4 cup cream, and rum in a small pitcher or measuring cup. Slowly drizzle the mixture over the top of the cake. You will likely have about 1/2 - 1 cup of the mixture left at the end. Allow the cake to soak up the mixture at least 1 hour. The cake should soak up any mixture around the edges of the platter. Mix 2 cups heavy cream with 1 tsp vanilla. Beat at high speed with a whisk. 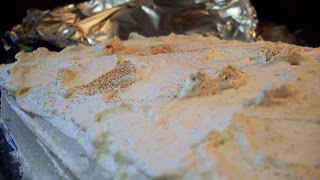 Slowly add up to 3 tablespoons sugar until cream is thick enough to spread. 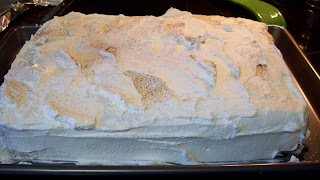 Frost cake with cream mixture. Lightly dust with cinnamon and serve. Store cake in refrigerator.